They say that 10% of anglers catch 90% of the fish. This is never truer than when fishing the Mataura around Gore. Many anglers have heard of ‘Match the Hatch’ fly fishing, but yet relatively few have really experienced this to any extent. On many waters trout can be ‘brought up’ to a ‘general terrestrial’ or something roughly similar in appearance to the natural, or maybe cajoled into accepting a ‘standard’ size 12 nymph. To be regularly successful upon the Mataura river, one must not only understand the fodder on which the trout feeds, but how to effectively imitate the different stages and present them flawlessly to well educated, selective trout. There is a saying among the rivers locals that ‘when the trout are not rising, nymph them in the ripples’, and this is just what we do. In-between hatches, when no surface activity is apparent, indicator nymphing among the Mataura’s fertile ripples can be highly rewarding. When nymphing, I prefer to use two nymphs, separated by 10 – 12 inches of trace material, tied directly off the bend of the top fly. I set my indicator, normally of a yarn type material, between two to four feet above my top nymph, depending on water depth, and current velocity. Any deeper than this and I feel I have lost contact with my flies, as strike detection comes with some delay. I find most nymphs will work on the Mataura, as long as they are of the correct size, and of a slim, dark construction. Hares Ear, Pheasant Tail, Hare and Copper, any of the above will take fish. My ‘Mataura Box’ is filled with various mayfly representations in sizes 14 through 18 in a variety of weights. I weight the 14’s and 16’s with standard, brass beads but use tungsten on the little 18’s for greater depth. I carry unweighted patterns in sizes 16 and 18 for use as a more naturally drifting point fly, and for use when ‘sight fishing’ to trout in the shallows, or up near the surface. My standard ‘go to’ set up in normal river conditions consists of a size 16 beaded nymph as my top fly used in conjunction with a smaller, unweighted 18 drifting freely on the point. In general I prefer to use black beads, to avoid unnecessarily spooking shy fish, but will employ a gold beaded, or ‘flashback’ nymph on overcast days, or when the river sports some color. This combination may increase, or decrease in size as conditions dictate. In swollen, or discolored water I might use a pair of size 14’s, while in low, autumn flows I may employ a pair of 18’s. Always start a little below the bottom of the ripple and slowly work your way into it, casting on an angle upstream. You’ll be surprised at how many fish ‘cruise’ the slower water near the base of the ripple, picking up invertebrate dispersed by the flow. Watch your indicator closely, and strike at any unnatural movement, bumps, minute changes of direction and brief hesitations… Not always will your yarn ‘take a dive’. Concentrate on the seams, or ‘edge-water’, where fast water meets slow, and do not disregard the extreme shallow water adjacent to your bank, especially mid afternoon when large numbers of nymphs enter the ‘drift’ before emerging. A sure sign of an imminent hatch is when the fish move into these shallows, and often you will see an increased number of nymphs collecting along the slack, edge water. Fish through the ripples slowly, covering any likely pockets, or seams with patience. The trout will often not see your nymph on its first pass, or even your second, due to the large amount of food already in the drift. I find it is important to get your fly down to the depth where the fish are feeding. If the trout does not take your fly, yet continues to feed, odds are you just aren’t getting a deep enough drift. Many anglers work through these ripples way too fast, anxious to cover ground. Little do they realize that a good ripple can be fished through time and time again, as many trout are passed by, and fresh fish move up from the pool below. Look for the more stable ripples offering both deep ruts and shallow edges, those which run into the deeper, more established pools. The pool provides cover and shelter to the trout, whilst the ripple above provides the food supply. To find a good ripple is to locate a goldmine, and often a highly productive day can be had by fishing just one ripple and the adjoining pool alone. Slow down and watch your catch rate increase! As the rise commences, be careful not to ‘rush in’. By doing so you risk putting down the early risers, and pushing them outside of a comfortable casting distance. Instead, sit and observe as more trout begin to rise, and move out towards the edges. It is wise to target these ‘edge feeders’ away from the main pod, which usually begin feeding out some distance from the bank. The more times a trout rises the more confidently he feeds, and covering a fish before he loses his wares usually results in him going off the feed. Pick one consistent riser and cover him repeatedly. When surrounded by rising fish it is easy to attempt to cover each one as they surface, but this often proves counter – productive. You risk putting down more fish than you will inevitably deceive. Is your targeted fish a ‘rhythm riser’, or does he feed sporadically? If he is the former then you can pick when he is about to surface and place your fly accordingly. If he is the latter, then you can but cover the water surrounding his position systematically and hope for the best. Whilst many anglers will swear that a direct upstream presentation is imperative when fishing out a hatch I disagree. By casting directly upstream to a fish, you will inevitably be landing your tippet, and part of your leader across the trout’s window. The finer tippet may transparent, but as your leader tapers, the line shadow increases, and Mataura browns are sensitive to this. Additionally, any ‘heavy’ presentations are likely to slap the water within close proximity of the fish, an action sure to put down your prey. Instead, I aim to position myself directly opposite the fish and cast across to him wherever I can. However, this is often not possible without the fish seeing you, so casting at an angle from the downstream quarter is the solution for an unobtrusive presentation. In doing this, your line, and leader will land well to the side of the fish, and as it drifts down the current your fly will be the first thing the trout will see. If you are casting across-stream you can manipulate your drift so that the fly is the first object to enter the fish’s window. An added bonus of this casting position is for those who have trouble with casting accuracy. By presenting your fly further upstream and overshooting your cast, a ‘tug’ on the fly line will drag your fly across the surface, pulling your enticement into the correct feed lane. Be careful not to perform this ‘cheat’ too close to the fish, however, as an unnatural drift is sure to alarm him. When the hatch is heavy the trout will hold closer to the surface, so as to feed efficiently while expending minimal energy. An inverted ‘V’ wake will often give away the trout’s presence when sitting high in the water column. When at the surface the trout’s ‘window of vision’ is much smaller than it is when sitting deep. This allows the angler to regularly approach to within a couple of rod lengths of his prey, but his presentation must now be delicate, and the fly must travel exactly down the trout’s preferred feed lane. It is important to remember not to cast to the rise itself. This is where the trout took the natural, not where he was sitting when he first saw it. A trout will often drift downstream some distance with the natural, scrutinizing his target before accepting it. With this in mind, it is imperative to present your artificial well upstream of the rise form. Observe the rise form, for this will dictate on which stage of the hatch the trout are taking. 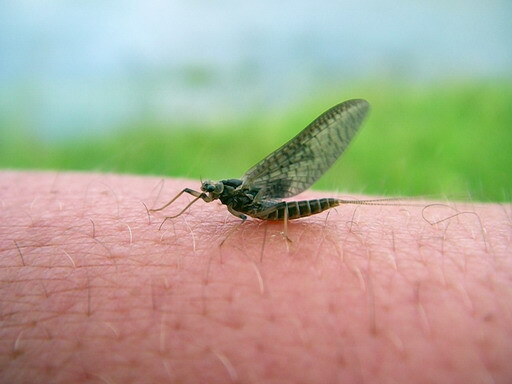 Trout will often ‘lock on’ to a particular phase of the mayfly life cycle, and this is where ‘matching the hatch’ becomes essential to success. A ‘head rise’, where the nose protrudes above the surface indicates a dun has been taken. This will often be accompanied with an audible ‘plop’ type of sound, as the fish takes in an amount of air with the insect. A ‘sip’ or 'bulge' signifies the trout are taking emergers, or nymphs in, or just below the surface film. This is often accompanied by the subtle ‘kissing’ sound of a fish gently sucking in a prey incapable of escape. At this point, the trout is likely to ignore any high floating, dry - fly presentation. A porpoising ‘head and tail’ rise indicates a leisurely rise to a spent spinner, an exciting rise form as often the length between the head, dorsal and tail can be gagued throughout the action. It is important to recognize each type of rise form, for each indicates a different stage of the hatch. When duns are hatching, there may also be spinners upon the water, and if the aforementioned ‘sipping’ behavior is observed, any presentation with a dun imitation will be futile. If the trout are porpouising, then an emerger pattern riding low in the surface film is called for, as the trout will ignore anything else. This is the key ‘match the hatch’ stage upon the Mataura, and a sound understanding of the emerging dun is what keeps the successful ‘10%’ of anglers ahead of the rest. In recent years it has become recognized that trout ‘locked on’ and rising to duns upon the surface will readily accept an emerger pattern. However, the reverse is not true. A trout feeding within the surface on emergers, or ‘cripples’, will feed solely upon this phase, and will unduly shun any ‘traditional dry’ presentation. As mentioned, when trout are feeding upon the emerging dun they can become fixated with this phase of the hatch alone. Your pattern must not only resemble the natural in size, shape and color, but most importantly, its position in the water. The emerger is the key to matching the hatch upon the Mataura, a time when the trout can be seen rising, but not taking cleanly off the top. This often creates confusion among anglers, who persevere with their traditionally tied 'Dad's Favorites,' and 'Blue Dun' patterns with minimal success. The emerger is not quite a nymph, not yet a dun (sounds like a pop song), and thus a specialist imitation is required to fill the void left by the more traditional patterns of nymph, and dry fly variety. Most dry flies available today imitate the adult dun. Tied to ride high upon the surface, they lack what I believe is the key trigger for selective trout - the sunken abdomen. Even those tied 'parachute style' fail to correctly imitate this I feel, for whilst they permit the body to hold flush in the surface film, the lower abdomen does not hang invitingly below, on par with the natural. Now many may think that this is taking things too far, but allow me to assure you, such inane details can, and will make all the difference upon the Mataura and many other waters in fact. Bob Quigley, creator of the popular 'Quigley’s Cripple' emerger wrote "On many occasions, traditional types of patterns will suffice, but during blanket hatches—especially on hard-fished waters—I've found fish that want neither nymph nor dun. They want both. A nymph can swim away, and a dun can fly away, but trout have learned that a dun caught trying to emerge from its nymphal shuck can do neither." This could easily have been written of the Mataura, and not having a good emerger pattern in ones fly box is where many anglers fail. So what makes an efficient emerger pattern? Bob Wyatt in his book 'Trout Hunting' claims "The significant visual aspects in these forms - size, silhouette, posture and behaviour - are all primary triggers to the trout’s predatory response. It is worth working out a strategy based on a reliable set of designs that fit the trout’s flexible and inclusive prey image and which incorporates one or more primary triggers." Working on this theory, Bob then designed the Deer Hair Emerger (DHE).Tied to be simplistic and more durable than the Klinkheimer series and other parachute ties, the DHE incorporates an erect wing, and hanging abdomen, two of the aforementioned 'triggers'. Tied on a curved, emerger style hook (kamisan B-100) Bob uses an olive / brown mix of seal and hare fur for the abdomen, fine deer hair for the erect wing, and spiky hares fur for the thorax. Tying details and images can be found on the Fly tiers Page (www.danica.com/flytier). Floatant is applied only to the wing and thorax to ensure the lower abdomen hangs subsurface. On smaller patterns (18 - 22) Bob says he uses snowshoe, a finer fur which is easier to manoeuvre on the smaller patterns. I have been experimenting with the hollow fibres from rabbit’s foot, and chamois fur, and have found both of these to provide adequate floating properties. I have been using this pattern a lot over the past season, favouring the more buoyant properties of the deer hair over my old faithful, the CDC Emerger. Its more durable properties are also a desirable attribute, and as a guide, is something I require in all my flies. Whilst CDC patterns are often referred to as 'once and aways' (one fish and they are gunged up and out of action for the remainder of the day), the DHE can be used on a succession of fish without requiring replacement. With its hollow fibres and resulting built in 'air pockets', deer hair seems to float longer than CDC and is easier to rejuvenate when waterlogged. A few false casts and your fly is again ready for a new drift. The only modification I have made to Bobs original tie is with the addition of a few strands of Z-lon, tied in at the tail to suggest the nymphal shuck. The emerger should be fished in the same manner as a traditional dry fly - cast upstream and across at your target, and allowed to dead drift. Whilst the natural may be struggling in the meniscus, these movements are minimal, and I have not found this necessary to imitate. At times however, you may be required to move the fly momentarily to catch the fishes' attention, as it drifts amongst a myriad of naturals. A single twitch is all that is required. Not all emerging mayflies make it through the surface. Due to defects or lack of vigour, many will expire while at the surface, and will remain available long after the hatch has tapered off. These will drift at the mercy of the currents and congregate in backwaters, eddies, and other slack water locations. Using a combination of the knowledge of such places, and a good emerger pattern, it is possible to rise fish long after the initial surface activity has ended. In Norman Marsh’s book ‘Trout Stream Insects of New Zealand’ (Millwood press, 1983), he aptly describes the appearance of the spinner in one word…’Brilliant’. Spinners are notably slimmer and more elegant than duns. In their final stages, Deleatidium spinners are a mahogany – red in color with amber, or ginger colored legs and cerci. They have clear, glassy wings, which reflect light when upon the water, giving off a ‘shiny’ appearance. Again, the differences between the spinners of the two featured species are minimal, and both can be effectively imitated with the one pattern. At times of little wind, male spinners will form ‘mating swarms’ near the water to attract females. After mating the males will expire, while the female returns to the streamside grasses for her eggs to mature. Female spinners require moderately warm, calm conditions in which to lay their eggs. Any wind stronger than a light breeze will bring difficulty to this process, and often precludes spinners from reaching the water. Thus, both dawn and dusk are favored times to experience a fall of returning, egg laden spinners. Some of the most prolific spinner falls will occur within the final hour of daylight, a time when the wind will often drop along with the setting sun, and when most birds which prey upon mayflies have taken to their roost. However, a spinner fall can occur at any time of the day providing the wind is kind, more so in overcast weather. In his book, ‘Norman Marsh’s Fly box’ (Halcyon press 1995), Marsh suggests that while aquatic insects enjoy warm conditions, they dislike direct heat. This explains why spinner falls will occur throughout the day in cloudy conditions, and of course, at times when the sun is at its least intense. Early morning spinner falls too are a regular occurrence upon the Mataura, coinciding with the rising sun warming the grasses in which the spinners rest. 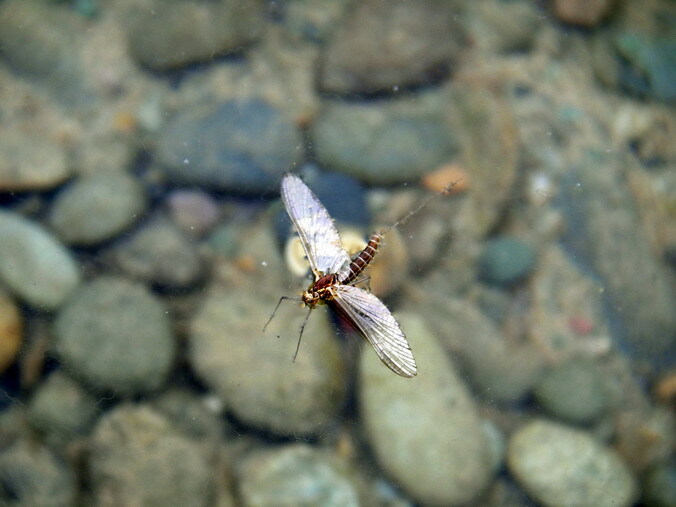 Female spinners will invariably fly in an upstream direction before laying their eggs. This behavior, in conjunction with the downstream drift of her eggs ensures a stable colonization of mayfly within that section of water. Without these upstream flight patterns, mayfly populations would eventually drift into the sea. Spinners will land on the ‘ripples’, the sections of increased surface velocity to drop their eggs. The ripply surface minimizes the meniscus, enabling the egg ‘cluster’ to pass through the surface film with minimal difficulty. The meniscus will be thicker upon the pools, and some smaller clusters may not successfully break through this. Each ‘cluster’ comprises of around 500 eggs and is deposited along with a temporary binding agent, to ensure the ‘cluster’ remains intact throughout the descent. This binding agent will soon dissolve, allowing the eggs to disperse amongst the rocks and crevices of the streambed. After depositing her eggs the spinner will then expire herself, falling ‘spent’ upon the water to provide the trout with a final feast as they drift peacefully down through the pools. Deleatidium vernale are often referred to as the ‘Mataura midge’, and will return to the river in many thousands, inciting great sport at last light. Great swarms may be seen hovering above river, and then just falling like stones, as they meet their watery demise. 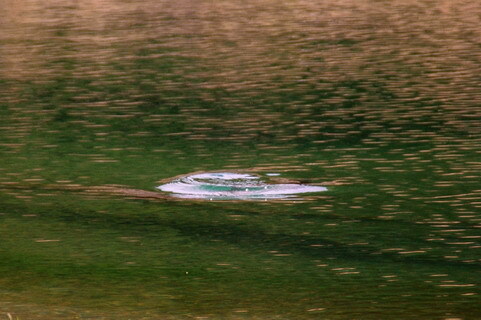 Trout will ‘lock on’ and feed selectively upon these spent spinners as they drift upon the surface in their thousands. Spent mayflies drift at the mercy of the currents, and are often concentrated in great numbers amongst the backwaters, eddies and along the slower river margins, providing dry fly opportunities long after the initial rise has ended. These are also productive locations to prospect during the lighter spinner falls, as larger numbers of mayflies here will keep trout more interested than those few drifting down the main river. These will not float forever, and will eventually sink, more so in the more turbulent water of the ripples. Trout will feed upon these sunken spinners well after the rise has ended, and the angler who targets the bases of ripples with a suitable imitation will increase his success as the rise tapers off. So how do we imitate these creatures of which the trout scrutinize closely in glassy calm pools, and glides? The answer is carefully, and with an observant eye. Size, I believe is the most important aspect of a spinner imitation. The difference between a 16 and an 18 pattern may not seem important to us, as anglers, but to the trout, these extra few millimeters will mean the difference between a sip, and a refusal. In their book, 'Selective Trout', Swisher and Richards suggest that as the size of the natural gets smaller, the trout will become more selective, and it becomes imperative that your imitation matches the hatch in both size and silhouette. Many trout are put down by flies which are too heavily dressed. If in doubt as to which size to use, choose the smaller. An angling buddy of mine believes in presenting a pattern slightly larger than the natural to spark the trout’s interest, but in my experience on the Mataura, I have found this to be detrimental to success. Worth mentioning is that I do not use an imitation of the upright spinner (those still alive, and returning to lay their egg sack), and find that fish will readily accept a suitable emerger, or parachute pattern when targeting these. This all changes, however when the spinner expires and drifts helplessly upon the surface. Trout will now become extremely selective during this phenomenon recognized internationally as the 'mad Mataura rise'. If trout are opportunistic feeders, then what causes them to lock onto one food form and feed so selectively? John Hayes in his and Les Hills excellent book, The Artful Science of Trout Fishing suggests that trout are more likely to feed selectively when food is abundant. When one food source is readily available in abundance, trout will key into this to take advantage of the opportunity to maximize food intake whilst minimizing their energy expenditure. Dr Hayes then goes on to explain that trout must discern between various forms of flotsam and other floating debris and authentic prey items. As mentioned earlier in this series, trout will create a 'prey image', utilizing any number of 'triggers' allowing them to recognize a given food source. Suggested triggers for spent spinners may include the bodies 'imprint' flush within the waters surface, the 'light pattern' created by the body floating low on the surface, and the legs possibly protruding beneath the meniscus, or maybe the sparkling light pattern thrown out by the shiny, transparent wings, laying prone, stuck to the surface. So how best do we imitate this lifeless, yet irresistible creature? I utilize two styles of fly when fishing a spinner fall. The traditional Mahogany Spent Spinner tie, and a sparsely tied parachute pattern, for use on more 'joggly' water, and in low light conditions, when visually locating ones fly becomes tricky..
Wing; White poly wing, or Z - lon, tied spent and sparse to imitate the natural. My parachute is of a similar tie, except I substitute the poly yarn wing with one to two turns maximum (we are keeping this pattern sparse, remember) of high quality grizzle hackle, and a high viz (white, black, chartreuse) post, to assist easy sighting of the imitation in low light, or glare conditions. When fishing a spinner fall I like to use the longest, lightest leader possible for the conditions. This often means 12 feet of tapered leader attached to 3 or 4 feet of 5x or 6x fluorocarbon. This is a time when ones tippet must not float upon the surface. Similarly, one may wish to use ordinary mono, and coat it with a mixture of Fullers Earth and detergent. Either way, choose a 'soft' brand of tippet, to allow your imitation to drift more naturally in and out of the varying micro currents. Often, when fishing to trout rising along the edges of calm, smooth pools it is not wise to cast from behind the trout, especially as they are normally holding just beneath the surface. The landing of ones tippet within the 'window of vision', however reduced this may be, will put these fish down. Alternatively, as when fishing emergers, I like to position myself adjacent to the trout, and cast my fly across to them. As mentioned in Part 1, when the hatch is heavy the trout will hold closer to the surface, thus his window of vision is severely reduced. You may move in closer to the trout’s position than if he was holding deep, under reasonable concealment. Your fly will land to one side of the trout, with the tippet and adjoining leader falling well away from the fish. When performed correctly your fly will be the first and hopefully only thing your prey will see. Spinners often drift in large clusters, and it is often difficult to decide if the rise was to your fly, or to a natural. This is when the use of two dries comes into play. At these times I will utilize my parachute spinner pattern tied onto the tippet, then on a dropper off the bend of this, say 12 inches or so behind I will attach my standard spent spinner pattern. This not only gives you two chances at deceiving the wily trout, but the parachute with its hi viz post help you in identifying both the position of your tail fly, and in detecting any takes you may not have decided upon. As the spinner fall tapers off and trout return to the depths, do not believe the dry fly opportunities are over. Spinners will drift at the mercy of the currents, and ultimately congregate in backwaters, eddies, and along the windward river margins, and trout will cruise these places well after the main act has ended, rising leisurely to the 'leftover' spoils. Those spinners which stay in the main current will eventually be dragged beneath the surface, and even throughout the spinner fall, those prospecting the bases of ripples with a suitable nymph or wet fly can pull up some good fish. Traditional wet flies such as the dark red spinner work well across and down, and can bring fish to the net in places where the angler has trouble in deceiving them by way of the dry. There are few specialist tricks required here, just fish two suitable patterns in tandem, and swing them through the ripple on a short, tight line, paying special attention to the meeting of the ripple, and the slower rivers edge. 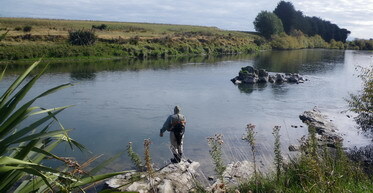 The Mataura spinner falls are legendary throughout international angling circles and provide perhaps New Zealand finest 'technical fly fishing' opportunities to a large population of fighting fit brown trout. Not all Mataura fish are large, 18 inches (a shade below 3lbs) being the average size, but during a good rise the angler will find himself with countless opportunities for deceiving free rising southern trout. How you handle the excitement is up to you. Wanna fish April with Chris? Spaces are limited but the fishing sure is not!